We are based in Pinner, Middlesex and provide accountancy and taxation services to individuals and business. The firm is authorised by the Institute of Chartered Accountants in England and Wales. 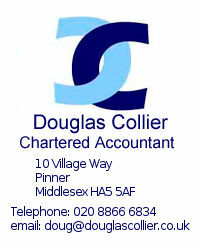 Douglas Collier is also a member of the Chartered Institute of Taxation. The full range of our services are described elsewhere on this website but whether we are preparing a simple tax return or a complex business valuation our loyal and highly valued clients can expect the same quality of service. Douglas Collier Ltd is a company registered in England and Wales. Registered office address: 10 Village Way, Pinner, Middlesex HA5 5AF. Company registration number: 03273554. Telephone: 020 8866 6834, email: doug@douglascollier.co.uk © Douglas Collier Ltd, Wandering Star 2018.